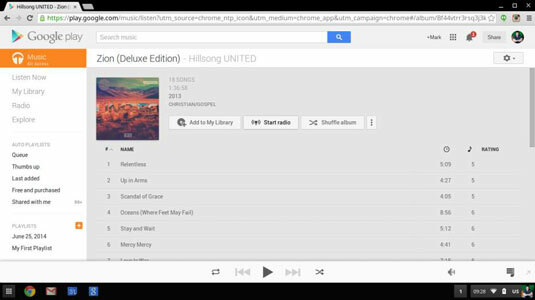 The Google Play library accessed on your Chromebook is where all of your music uploads and music purchases reside. In the standard account, your Google Play view defaults to your music library. If you aren’t in your library, you can get there by locating and clicking the My Library link on the left side of the page. Your library loads, revealing all of your music that’s available to stream. Add Your Music: Upload your music. Shop: Shop the Google Play store for songs that you want to purchase and add to your Google Play library. With the standard account, Google Play allows you to upload up to 20,000 songs. If your collection is bigger than that, just upload the music you listen to most and leave the back catalog on a jump drive. Click the Add Music button in the top-right corner of the Google Play window. The Add Music screen appears. If Files isn’t already open, launch it by clicking the Files icon in the App Launcher. 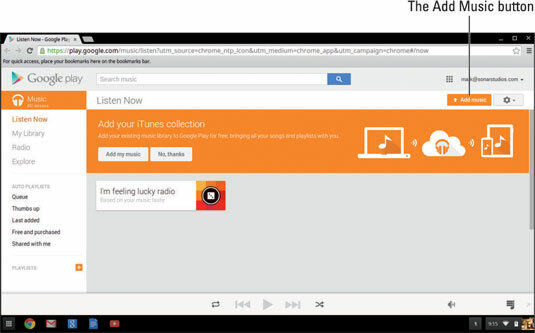 Navigate to the folders on your Chromebook that contain the music you want to upload. Select the file(s) or folder(s) that you wish to upload and then drag-and-drop them in the Google Play window. Google Play queues the files and uploads them in the background as long as Google Play is open. You can monitor the progress of your file upload by clicking the Processing Music button (which displays the flashing upload indicator icon) in the bottom-left of the Google Play window. Google Play’s music library is vast like the ocean. If you have a standard account, you can expand your music selection by purchasing songs from the Google Play store. If you have a premium account, you also have the option to purchase songs, but there’s little reason to do so because you can stream any song in the Google Play database for no additional charge. With Google Play Music open, click the Shop button on the left side of the page. The Google Play Music store opens. Begin your search for the music you want to buy by using the Search bar at the top of the screen. Just type in the name of the band, album, or song, and then click the Search button located at the right side of the Search bar. Google Play serves up search results categorized by Artist, Album, and Track. Locate the artist in the Artist section and click their picture. The Artist Profile page appears. In the Artist Profile page, click the album you’re looking for. The Album Profile page loads. You have the option to purchase the entire album or individual songs, as shown in the figure. It’s always a good idea to select the artist first. Many variations of songs are available today, so it’s easy to accidentally select the wrong version. First select the artist, and then locate the album from the artist’s Google Play profile. You can then purchase the entire album or a singular track. You can buy the entire album by clicking the price located next to the album artwork at the top of the page or purchase just a song by clicking the Price button associated with the desired song. A pop-up window appears, asking you to confirm your payment method and the purchase price. Click Buy to complete your purchase. Google charges your payment source and adds the song(s) to your library.